After some inspiration from recent posts about different kinds of yeast water folks are making, I revived one I'd had neglected in my fridge for about a year. It was originally made with plums from my back yard, but I ended up maintaining the apple one I made at the same time and ignoring the plum one, until now. 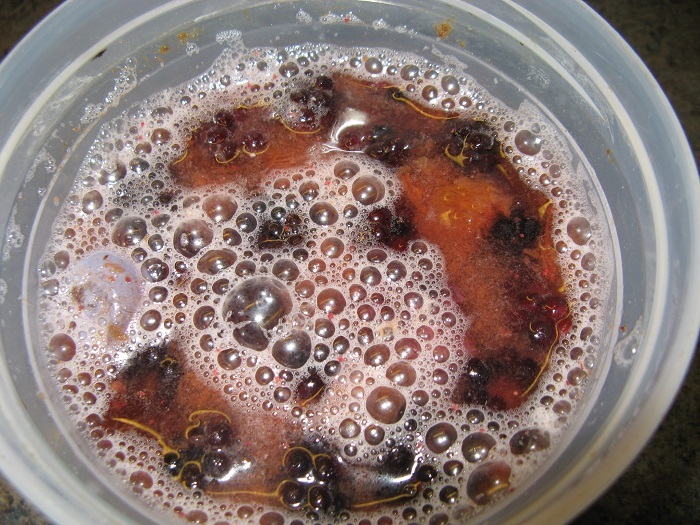 I took it out - it looked and smelled fine, so I scooped out the depleted plum pulp and dumped in a handful of fresh blackberries. After two days it was beautifully fizzy and smelled great! I followed Hamelman's recipe for Swiss Farmhouse Bread (from "Bread"), more or less. The first build was a bit of a disappointment. After sitting for most of the day it was stretchy but had no perceptible rise at all. Given that result I deviated from the recipe and used yeast water (rather than plain water) for the second build as well, and left it overnight. Much better results - this morning it was billowy and smelled lovely. 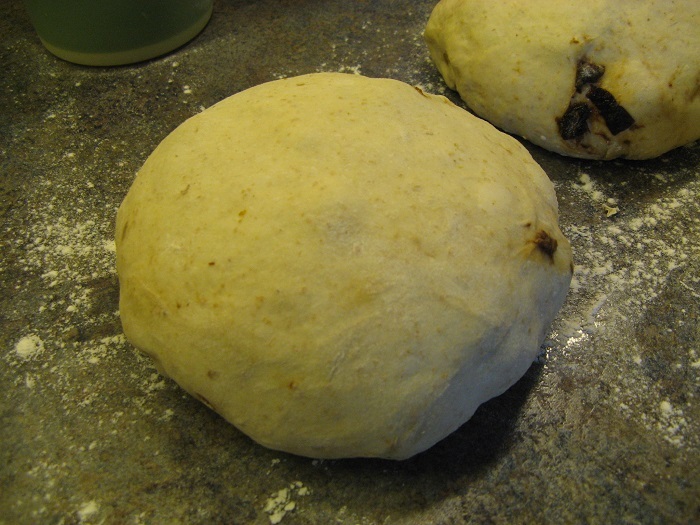 I made the dough as per the recipe except rather than raisins I used chopped prunes (it did start as plum water, after all). Also, I don't really like nuts in bread so didn't add the walnuts. 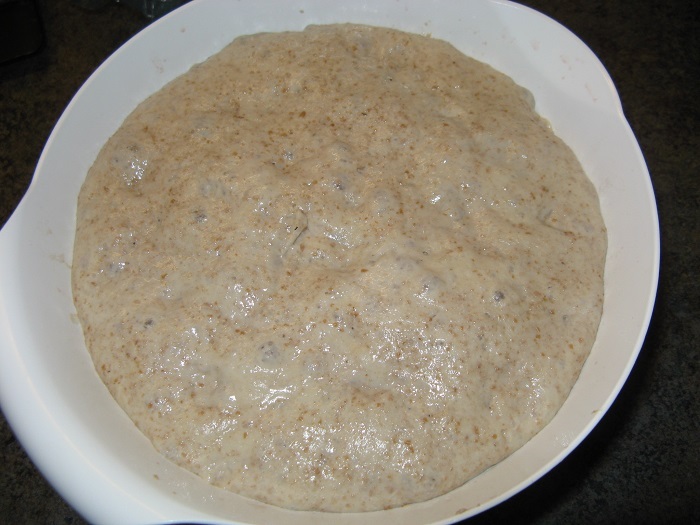 The dough was very strong and I found it a little stiff so added a bit more water while mixing (in the Ank). I did two stretch & folds 30 minutes apart as the fruit wasn't quite evenly distributed. Very strong, smooth dough. I put it in a clear container so I could look for bubbles. YW dough seems to ferment / proof differently. There seems to be very little action for the longest time and then, suddenly, it's ready! 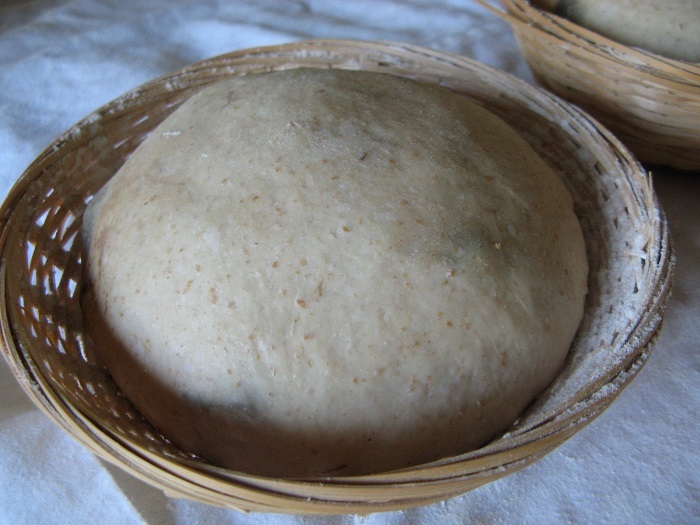 Bulk ferment was a little longer than Hamelman's instructions though the dough temperature was almost identical to his. I divided into three loaves rather than two, as we like smaller loaves for just the two of us (so, three loaves at around 640 grams each). Pre-shape was a dream; this dough is so soft and silky, and has terrific gluten development. After proofing the loaves were still holding their shape perfectly. The loaf maintained its beautiful shape throughout, with great oven spring. 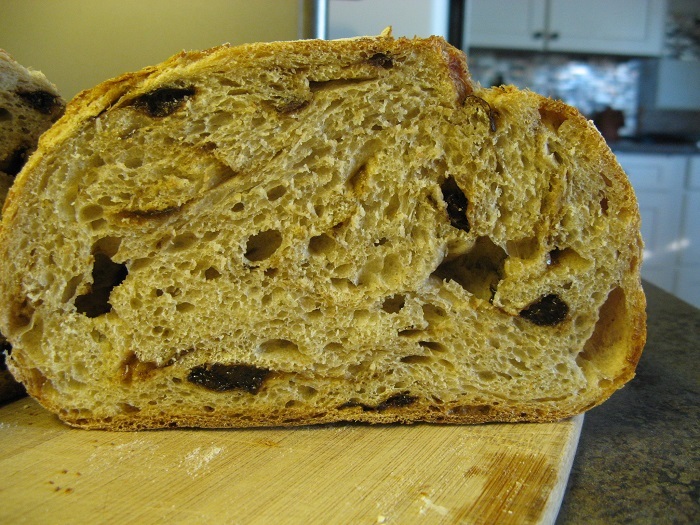 And the crumb is absolutely wonderful - moist, light and creamy, with a delicate flavour and a thin tender crust. The texture of the best sourdough with no sour! 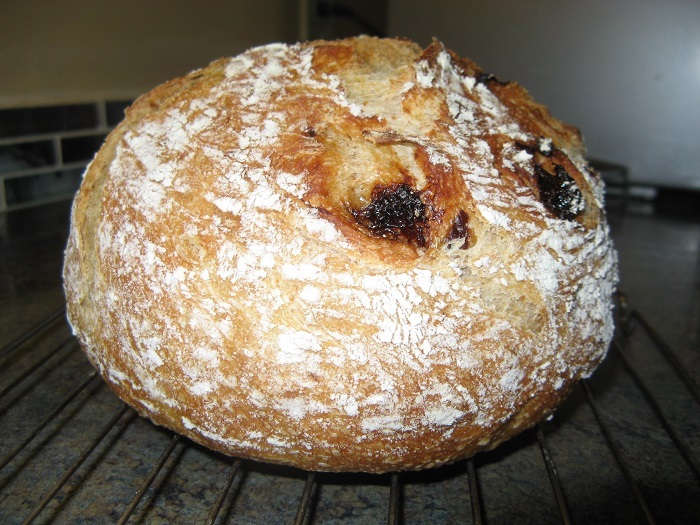 I'm very, very happy with this bread and will maintain that plum/blackberry yeast water now for sure! I haven’t had any luck with that recipe. I ended up with a brick both times I made it. Yours is stunning! I think it’s more than just timing! By the way, I was just scouring your posts about doing bulk in the fridge and baking a couple of hours later. The reason was that once the bulk fermentation was just about done, I put the dough in the fridge for 4 hours while I headed off to pottery. 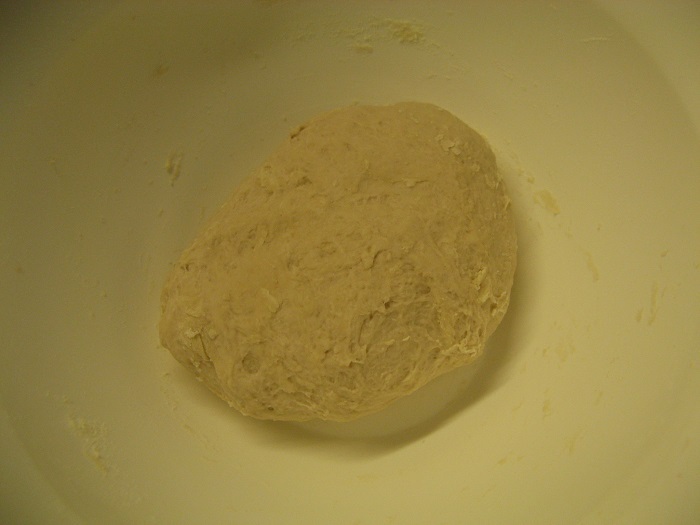 When I got back, I let it rest 20 minutes after dividing before shaping it. I couldn’t decide whether to bake it tonight or put it back in the fridge and bake in the morning. I didn’t know if the four hours was long enough to be considered an overnight bulk retard the way you do or not. I chickened out and let it rise on the counter for 90 minutes and put it in the fridge to bake in the morning. I figured the dough wouldn’t be so floppy, and maybe my little proofing seam side up and scoring experiment to see if I get better ears would be easier. Let me know how it turns out in the morning. I think the longer bulk may provide better flavour, but probably doesn't do too much for structure (more than the bulk ferment and 4 hour retard that you did, I mean). Try scoring the boule with a 'smile' and see how that does for producing ears (okay, too many mixed facial metaphors!). wish I could bake, no time at the moment. crumb looks lovely - yum yum all round. When we get home again YW will definitely be on the bake list - will feed it tomorrow and let it sleep for a month - should be fine. I am amazed that yours was still good after such a long sleep though. What kind of yummy yeast waters are you making? You said raspberries, right? Anything else? I'd really like to try some of the herbal ones that folks have made (like rosemary). lol, 1 is enough for me at the moment. Yes it is raspberry, it smells divine and looks gorgeous! I did’t have a very big harvest this year so only have a small amount of berries frozen. just enough give it a few berries from time to time. Mostly feeding it raisins for now. Trailrunner’s tip of adding some fresh orange peel has really been beneficial. maybe next summer I will try some other fruit as well. That certainly has turned out a treat , im quite fascinated and tempted to give this yeast water a go my self, is it just a matter of capturing your natural yeasts and the ones present on the fruits themselves getting them working with the fizz and then building your levan prior to your intended bake. The fact that it was in the fridge for such an extended period has a great deal of appeal. I think the ending is always a nice surprise with yeast water. For what it's worth my experience with this recipe is very much like yours. First build is a bit meh, second build (although I've always switched to water in this stage) is much better and the recipe is showing a lot more promise, the bulk ferment needs warm temps and I think even a slight fluctuation can alter the timings a lot but it comes through in the end, final proof goes smoothly as long as the bulk ferment is done properly and the bake is always a nice surprise. 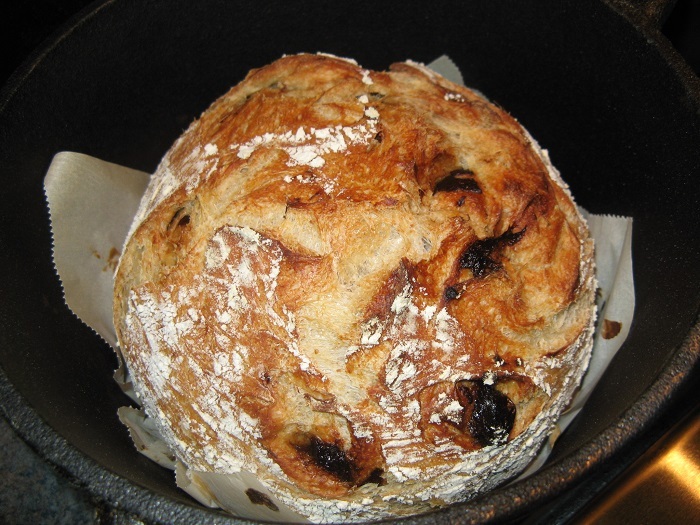 Oven spring is excellent, the smell coming from the bread is awesome, the taste and crumb just perfect. Your loaf looks wonderful! Lovely! Wendy. I didn't know yeast water could survive for that long with no maintenance. Lazy Loafer's Recent Blog Entries. Cream Cheese & Onion - No Measure! Caramelized onions - big batch!